First Big Thanks for Pete Michelmore for the use of our new club house location at Fort Gravity. Thanks to Ginny Coe for collecting and organizing the waivers and dues. I was late. Membership Paid $20.00 with Waivers. As of March 5 the Kahana permit is renewed and we are good to go. 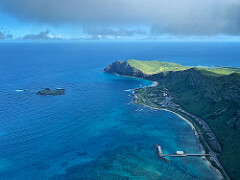 As of March 12 the Makapuu permit is renewed and we are good to go. Once again we are running late with our annual USHPA insurance renewal. This year we have different excuses but the outcome is the same: it's going to be late again. Dave Goto just called me to confirm that the HG club is in the same boat. In the meantime activities at both Kahana and Makapuu will be suspended as of March 1 until the insurance is back in place. Dave Goto says the Makapuu LZ is off limits, and that includes Frank's spot according to the language of the permit. Hopefully we will see the insurance renewed within a week or so. Sorry for the inconvenience and thanks for your cooperation. Contact me or Fireman Dave or Dave Goto with any questions! 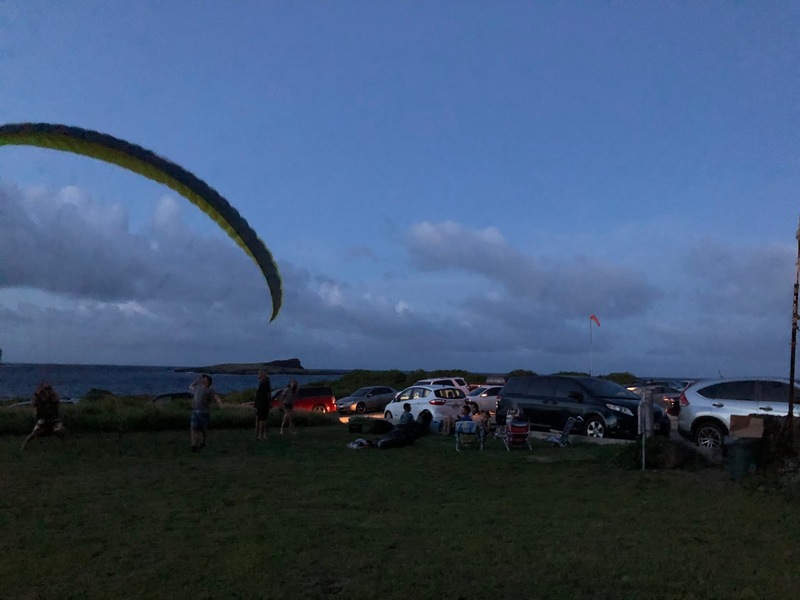 UPDATE for 3/6/19: It looks like we are in for an especially strong weekend of wind, so the likelihood of a bunch of us tearing up the sky over Lanikai is slim. Not to say people like Alex aren’t considering giving it a go on miniwings. But for most of us, we will meet up at Reapers Fort Gravity about 6pm. Drinks and pupus are welcome. The next club meeting is Saturday March 9, 2019. The format will be a little different this time, we will begin about 2 pm at the beach in Lanikai at the end of Mokumanu St., otherwise known as the LZ. Weather conditions dependant, we will all hike up to the pillboxes and see how many pilots we can get in the air. Yep, that is right an old school Lanikai fly day! The party will happen at Reaper's House, also known as Fort Gravity, 660 Palawiki St. afterwards. But maybe not, if the weather is nice we can throw the meeting right there on the beach in Lanikai, we will update here. Bring $20 for membership, drinks, pupus and come have an afternoon/evening of fun in Kailua. Watch for updates here! Voting is open for the USHPA Governance Election. In short, you vote 'NO' if you want USHPA to continue with the same 26 member governing board, 'YES' if you are in favor of the smaller 10 member governing board. You should have received an email and a postcard with a voting code, the election is until 2/21/2019. USHPA would like to see a strong turnout either way. For those of you who inevitably ask how to vote. Dave Goto is against the change, Alex is for. This is meant in no way to influence your vote, they both have strong arguments, so educate yourself and make your own choice. Any comments are welcome. Happy flying! Getting together with friends high over our little island for some classic downrange flying is one of my favorite things to do on a paraglider. We all want to go far, do something new, set a personal best or just witness the festivities from the top row. This past Tuesday was one of those days. Most people weren't thinking it would be good, but Jorge was, and that was good enough for me. The buzz around was that pilots were meeting at Makapuu about 1 pm to see what the day had. It’s the last day of 2018. 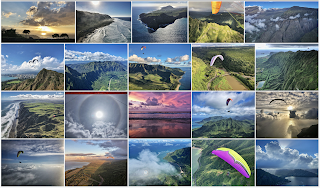 Probably one of Oahu’s stingiest and most underwhelming years overall, as far as weather conditions or epic flights. Those of us committed to fly found ourselves up there on windier and rainier days than ever before, often under lower clouds than ever. Not to mention we survived unprecedented missile and hurricane scares! But for sure we still enjoyed a few notable flights and more than a few splendid moments in the air. Here’s to a New Year with more splendid moments for all of us! Please support getting a weather station at Makapu'u -- and get FREE WIND INFO while you wait! For some of us, it’s kind of a long drive to either Kahana or Makapuu, and it can be hard to know when and which way to go. Is anybody there? Are they too busy flying to post conditions? Should we just start calling the usual suspects to ask how it is? Should we ditch this baby luau early, or stay and maintain our other relationships? Or just take a leap of faith and maybe end up spending 2 hours driving and who knows how many additional hours parawaiting (which can be fun except when no one else is there). 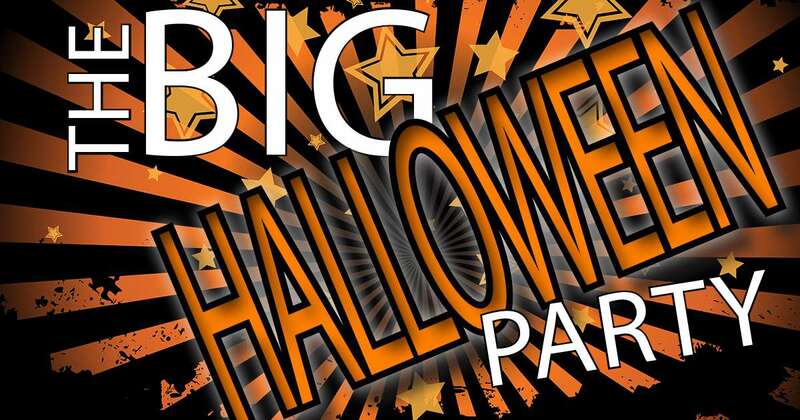 Saturday Oct 27th, 2018 we will be hosting a paragliding club costume party at Fort Gravity. Costumes are required for admission. 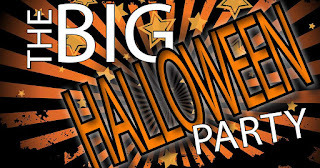 Prizes for the best costume include round trip airfare for two to Maui. 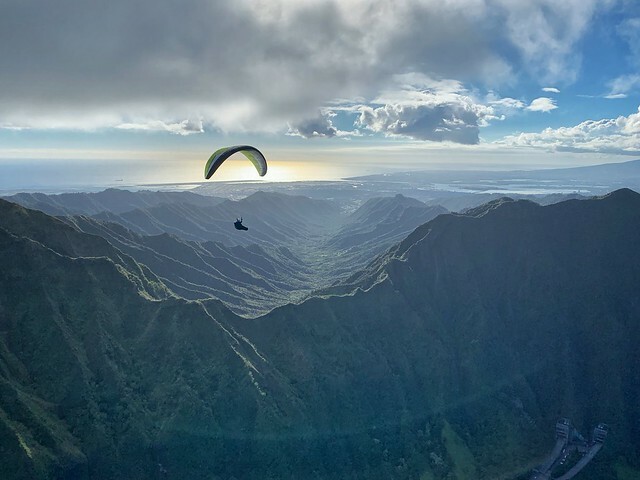 This will be an official Hawaii Paragliding Association meeting starting at 6:00 pm, with the party and BBQ afterwards. Anyone caught after 2:00 am turns into a pumpkin...! Fort Gravity is located at 660 Palawiki Street, in Kailua. Big Nick our beloved Rat Race volunteer driver since 2010 is getting hitched at Makapuu little beach today at 5:00. 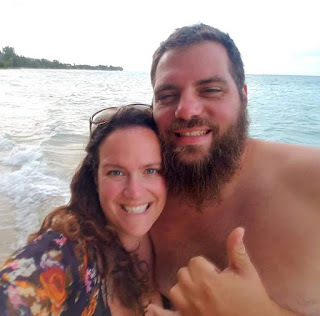 Nick is an avid paraglider pilot and tireless volunteer from Portland, Oregon that I have had the sincere pleasure of working with at the Rat Race for over 7 years. We actually do fly, and Nick and Lyla have been our volunteer buddies at the Rat Race. Lyla is his amazing other half, and she supports Nick's habit of volunteering and flying every year. So, as is tradition in the paragliding world, we honor our better support staff and beg them to marry us. Well lucky for Nick, Lyla said "Yes". 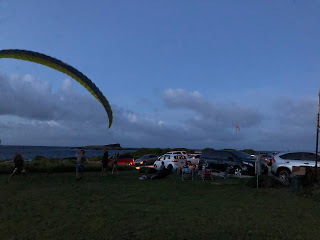 While yesterday's full moon LZ party didn't draw much interest from our Oahu pilots, a good number of visitors from Maui made up for it. There were probably a dozen or more people out there for some lunar powered fun. The wind direction was perfect and the wind speed was stiff, but it wasn't too strong for some fun flying. I do apologize for these photos, they were shot in near total darkness on my iPhone.